I feel fairly confident in saying that every single person (at least in the US) who has ever made, eaten or even mentioned macarons has had to explain themselves. No, they are NOT macaroons. So stop looking at me like I sprouted a third eye when I go on about how delicate and finicky they are to make. I know you can make those little plops of sweetened coconut all by yourself and not have to worry about feet, domes, cracking, fillings, etc. 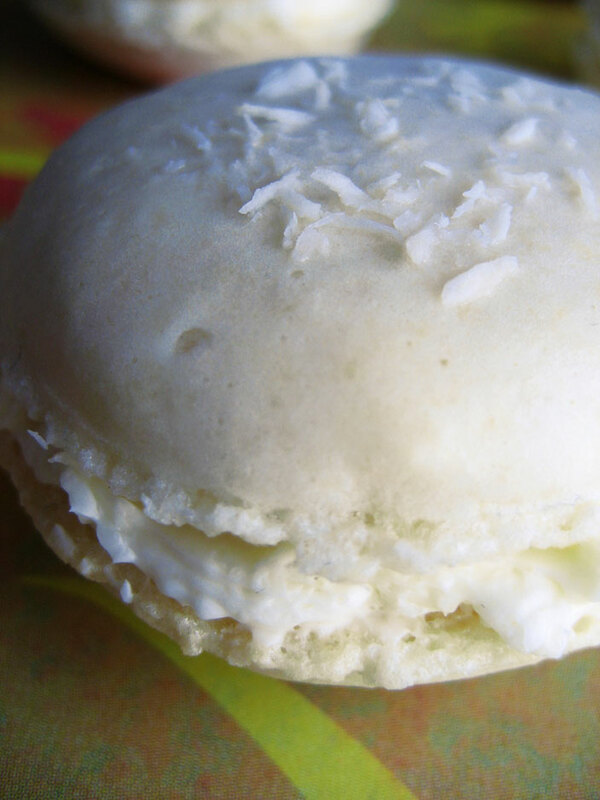 No coconut is involved in the macaron. Next time I'm making much more colorful ones, I promise! …Well, USUALLY no coconut is involved. Can’t say that holds true when you have a coconut-loving boyfriend like I do. These are purely for Z, and I wasn’t even going to post about them because I wasn’t impressed with them. They were the first macarons I baked on my Silpat as opposed to on parchment, and I think it may have affected the height on the feet. They’re there, but just barely. And I found it is nearly impossible to remove a macaron shell from a Silpat in one piece. Or maybe that’s just me. I admit I DO like the sprinkling of coconut flakes on the shells. I also found the color to be, well, not so colorful, and after posting an all-white macaron already, I didn’t want to seem monotonous. But last night, while Z was happily gorging on the goodies that have been accumulating in our fridge, he convinced me that I should probably post about these. Because he loves them that much. Macarons are fun to stack! 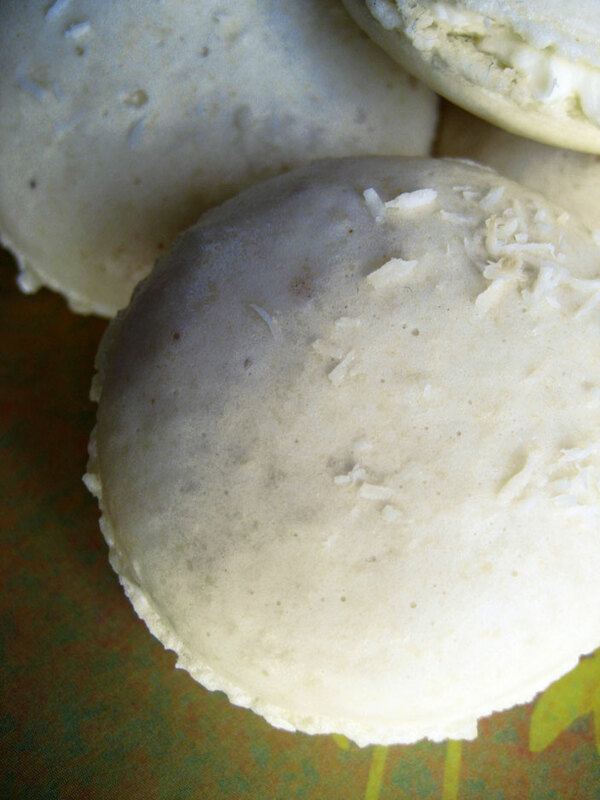 I still have plenty of coconut on hand, so I will probably try these again. But I think I’ll be adding sesame and perhaps a little ginger to the mix, in tribute to one of Z’s favorite ice creams – after popping these in the oven, I realized that sesame seeds would have been a more interesting thing to sprinkle on the shells. But the coconut does work, and toasts up just a little bit in the oven. At least my shells are round, domed and always come out the right texture, in spite of other flaws. My only other complaint about these is that I don’t care for the filling personally – it is a bit too buttery. Also, the only coconut extract I could find was imitation, meaning it smells like suntan lotion. It’s interesting how a fake extract like that is acceptable until you get it right up next to the real thing. I would encourage anyone wanting to try these to maybe cut back the butter a bit and use a natural flavoring. But if you have a butter-loving coconut fan to feed, you may not have to make any adjustments at all. They didn't all come out the same size, but they did all come out circular. Hooray! Prepare a baking sheet with either parchment or a Silpat. If using parchment, you can trace circles on the bottom as piping guides. Sift together the powdered sugar and almond meal, sprinkle with coconut and set aside. In a stand mixer, whip the egg whites to a foam and gradually add the suger until you obtain a glossy meringue. Fold the meringue into the dry ingredients, quickly at first and then more deliberately until there are no more streaks of dry ingredients visible (not more than about 50 strokes). Test a small amount of the batter by dropping it onto a plate or other flat surface – if the peak flattens slowly by itself, the batter is ready. If it’s stiff, give the batter a few more gentle folds and test again until it’s ready. If you’re using parchment, take a bit of the batter and apply it to the corners of the paper to help it lay flat on the sheet. Place the batter a third or so at a time into a pastry bag fitted with a large round tip and pipe the shells. Sprinkle each piped shell with some of the extra coconut and allow to sit for an hour to form a skin. Halfway through that time, preheat the oven to 300 degrees. Bake the shells for 10-13 minutes. If they seem a bit overly wet on the inside at the end of the cooking time, turn off the oven and prop it open, allowing the macarons to sit and dry out a little. Once the macarons are fully cooled, remove them carefully from the baking sheet with a sharp implement to help loosen them (if you try to just pull them off chances are you’ll decapitate the poor things). Set aside. Place the egg whites and sugar in a heatproof bowl (if using a stand mixer, the bowl from the mixer is fine). Bring a small pan of water to a simmer and place the bowl over the water to form a double boiler. Make sure to not let the bowl touch the surface of the water. Stir continuously until the sugar is dissolved, then remove from heat. With a stand or handheld mixer, whip the egg whites on high until stiff peaks form, then quickly mix in the coconut extract. Switch to the paddle if using a stand mixer, turn the mixer down to low and beat the butter in one piece at a time, making sure each piece is fully incorporated before adding the next. If it looks curdled at any point, keep beating it and wait for it to smooth itself out again. Spread or pipe between fully-cooled shells, sprinkling with dessicated coconut before sandwiching them together. I’m enjoying playing with macarons – coming up with flavors and fillings for them is just as fun as coming up with elaborate cupcakes. 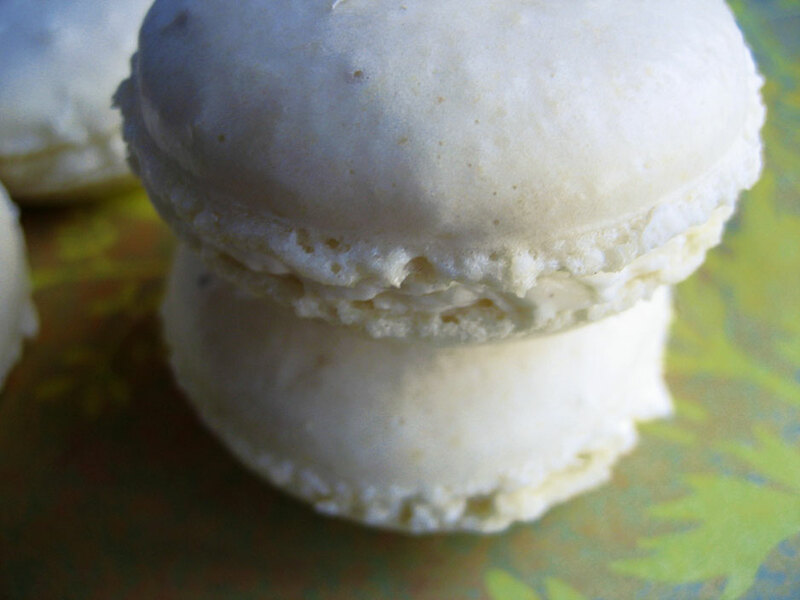 I’ve got tons of ideas that I’d like to try over the next few months so you’ll be seeing a lot more macarons. Hooray! 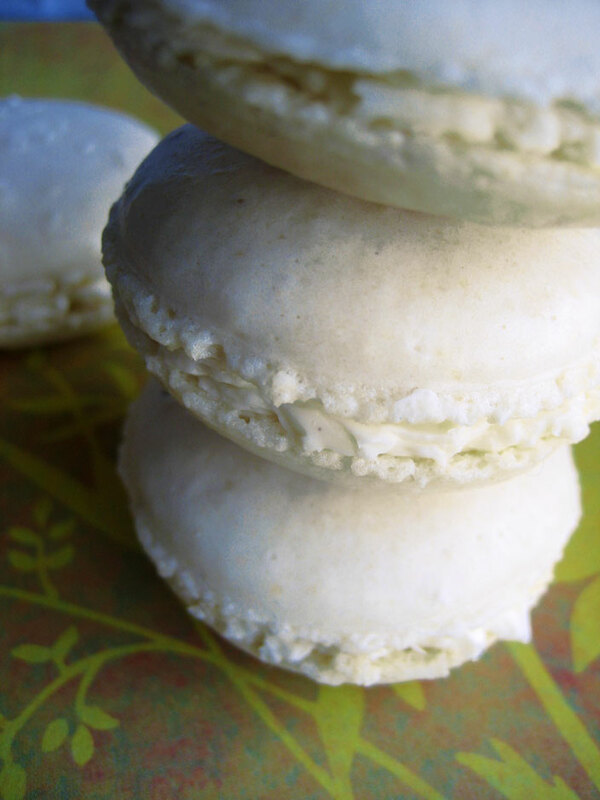 The white is gorgeous and adding the coconut to them makes them incredible. I’ve never made them, but now I have to. They turned out beautifully. 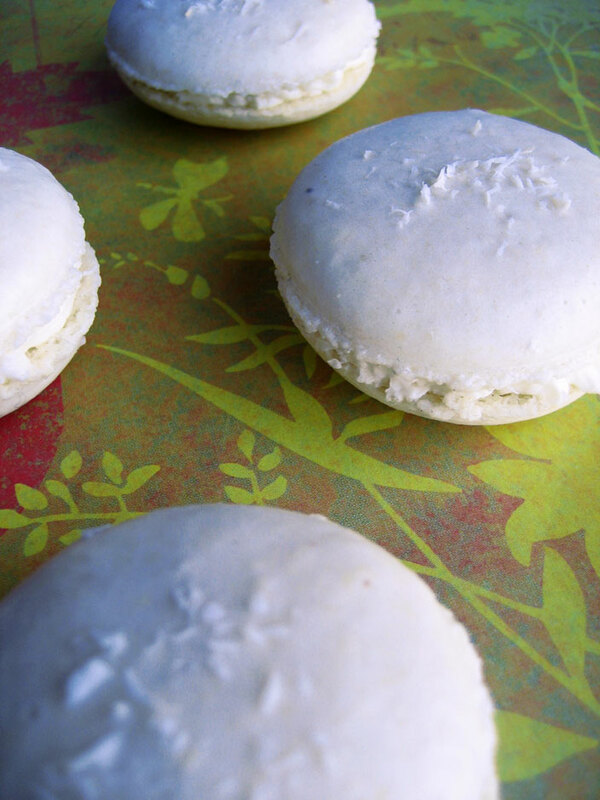 And I agree, Silpat is great for some things, but parchment is perfect for macarons. Awww gorgeous! So white and delicate! I always feel like applauding when I saw perfectly formed macarons as I know how hard they are to get. Yes!! I love coconut! Brilliant combo. Now if only I could get my husband into coconut, my life would be complete. He hates the stuff.